While Becky Moeggenberg started volunteering as a Program Guide in the fall of 2017, her association with Music Hall goes way back. As a young adult, she discovered that she loved the Cincinnati Ballet and attended many CBC performances here. This historic structure has also been part of her family’s history as her grandfather was general manager of Music Hall from the early 1920s to the mid-1930s. Her favorite spot in Music Hall is the Gallery, where she gets what she describes as a wonderful view of the exquisite, sparkling chandelier, the Allegory of the Arts mural, and a panorama of the entire Auditorium. The seats are great, she says, and inexpensive! Becky is a native Cincinnatian and feels that Music Hall is an endearing symbol of our city. 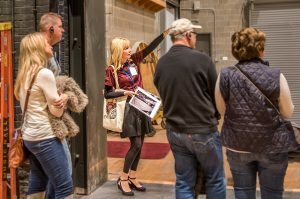 On tours, she loves discovering connections people have with Music Hall. I want to know a performance that stands out in their minds or a special occasion they celebrated there. I want to know if they danced at the Topper Club! A building is just bare walls without the human interaction within them. In addition to conducting tours of Music Hall, Becky is currently working on a Cincinnati Ballet presentation for SPMH. The presentation will be available to fellow Program Guides, to enhance their knowledge of the resident companies. Recently, Becky and her “poodle mix” dog were accepted into the therapy Dog Visitation program at Cincinnati Children’s Hospital. They’re undergoing training and will then join with other visiting dogs to provide comfort and affection to children and their families. Even though her volunteer schedule is demanding, Becky fits in family time and “me” time, reading and studying French at home, and sharing experiences with her loved ones, around the city and on nearby bike trails.